The second thing that explains the different nature of this revolution is just how interconnected everything is. Technology, security, economic growth, sustainability. Technological change is never an isolated phenomenon. This revolution takes place inside a complex eco-system which comprises business, governmental and societal dimensions. To make a country fit for the new type of innovation driven competition the whole ecosystem has to be considered. So if one thing changes – or is changing constantly, as in the case of technology – the whole system needs to change to keep up. The third big difference is the fact that the technological revolution is not just changing what we do and how we do it – it is changing us, it is changing our lives, and it is changing the way we see the world. Just look at how the internet has altered the notion of privacy. Young people have a completely different understanding of the idea of privacy compared to older generations. We often hear people talk about the concept of ‘uberization’, where a new technology completely turns an industry on its head and forces us to rethink the way things have always been done. No industry will remain untouched by these forces. Speaking recently to a CEO from one of the world’s largest aluminium manufacturers, I commented on how lucky his company was not to be affected by this revolution. As he was quick to point out, technologies such as 3D printing will completely transform his industry’s supply chain, with knock-on effects we probably have not even considered. And the revolution will not just affect industries – it will also affect people. Many of the consequences will be positive. For example, medical research and technological innovations mean that in places like Switzerland, one in two babies born today will live beyond 100. But whatever the changes, almost all of them will present a challenge. As new technologies make old jobs obsolete, for example, every person will have to make sure they are equipped with the skills needed for this new era of ‘talentism’ – where human imagination and innovation are the driving forces behind economies, as opposed to capital or natural resources. Governments will also feel the impact of these changes. In the future, people will not be satisfied with ordering only their taxis through an easy-to-use application. They will also want to access public services in a similar way. More than any other sector, governments can also shape the consequences of the technological revolution, ensuring that the challenges are managed and the opportunities seized. For example, although innovation and creativity tend to be driven by the private sector, governments create the environment that allows these things to flourish. They also have a large role to play in ensuring citizens are equipped to make the most of these tranformations. Change can be frightening and the temptation is often to resist it. But change almost always provides opportunities – to learn new things, to rethink tired processes and to improve the way we work. The technological revolution has only just begun, and the transformations it will bring are a cause not just for excitement, but for hope. 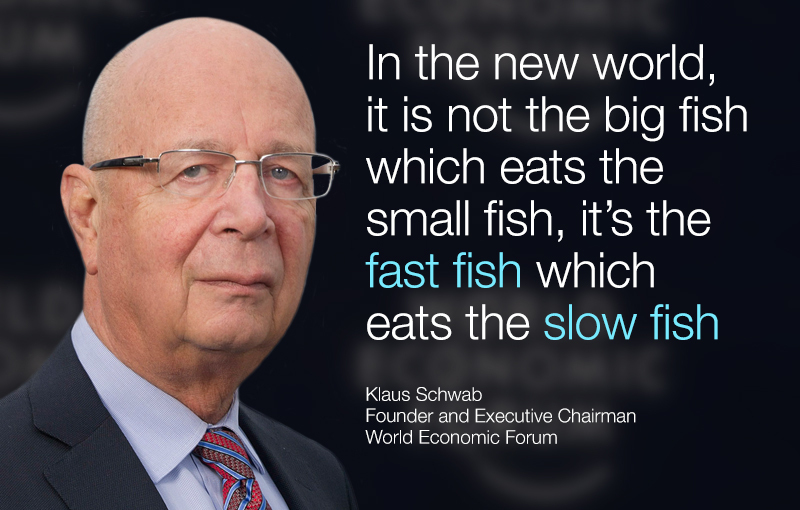 Author: Professor Klaus Schwab is the Founder and Executive Chairman of the World Economic Forum.